Exquisitely located at the edge of the sea, and at the most prominent spot of Byblos Harbor, Byblos Sur Mer hotel provides privacy and serenity in a truly charming setting and offers its guests the comforts of a home at the heart of a legend. Byblos Sur Mer overlooks the ancient Byblos port and castle on one side, and a panoramic view of the Mediterranean sea on the other, in a carefully decorated space furnished with local art and artisanal wares, ancient relics, and precious items from private collections. 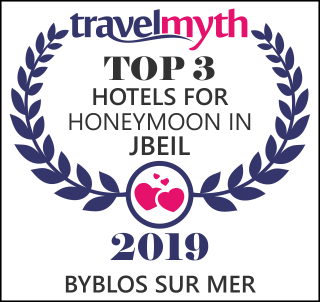 Originally built in 1967, Byblos Sur Mer was reborn in 2010 as a charming boutique hotel where modern luxury marries an odyssey of 7,000 years of history. Throughout the renovation of the hotel, every effort was made to ensure that historical details were preserved and showcased for their beauty and cultural value. So deeply are we bound to our heritage, that even our logo is a piece of history: While excavating, we discovered a Roman-era oil lamp bearing the image of two migrating birds who became the inspiration for our revived logo. These two birds at rest were but the first of many intrepid travelers to visit our shores, and our doors are open to welcoming many more.